Click here to download the Spring 2018 Catalog! 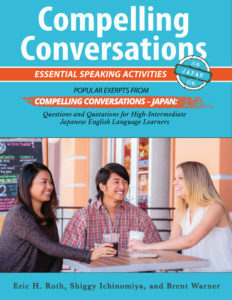 An abridged special edition of our culturally-specific 2015 conversation book, Essential Speaking Activities streamlines the communicative techniques used in prior Compelling Conversations books and provides easier access to new Japanese English language learners. Available as a Kindle eBook! 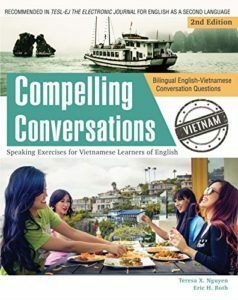 Designed for intermediate ESL students who speak Vietnamese as their best language, this supplemental collection of bilingual questions from the second edition of Compelling Conversations – Vietnam goes from simple questions to more reflective questions on 14 topics.